Join The Protest Rally in Glendale on April 10, 2018! Join The Protest at Glendale City Hall on April 10, 2018! Glendale is planning a 0 million expansion of the Grayson Power Station that will increase emissions by 415,000 metric tons of carbon dioxide annually, increase ozone and particulate pollution, and generate electricity to sell to other cities. Join The Protest at Glendale City Hall for a rally to stop the Grayson Expansion! 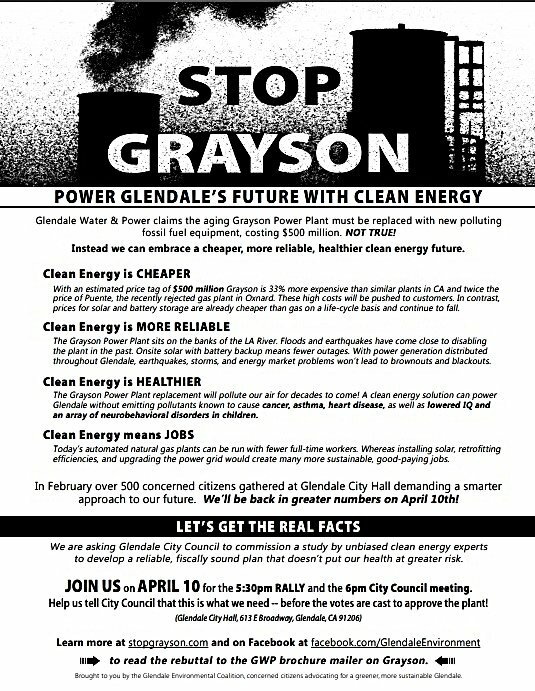 JOIN US on Tuesday, April 10 at 5:30pm at Glendale City Hall for a rally to stop the Grayson Expansion! Immediately after the rally we’re asking Glendale City Council to vote to halt the Grayson Plant expansion and hire independent energy experts to review Glendale’s power needs. Glendale is looking at a 0 million expansion of the Grayson Power Station that will increase emissions by 415,000 metric tons of carbon dioxide annually, increase ozone and particulate pollution, and generate electricity to sell to other cities.